I've recently written a couple of riveting fantastically enthralling mildly interesting posts at The Bad Mommy Blog. omg I got the shivers when I saw that picture :-) Delicious! I am totally unable to "get jiggy", but I am completely capable of appreciating one beautiful man. Does the Wild Oats guy look anything like Will? 'Cause I could start buying my groceries out of state if he did. 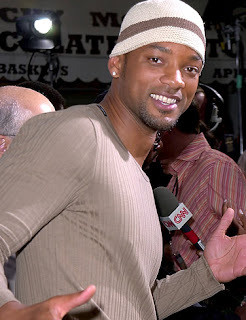 I love Will Smith...have since that goofy TV show he did. But...really...how does one "get jiggy" with something? Have I been doing this naturally over the years, or is there a Dummies' Guide to help me out? Do I WANT to get jiggy with something/one? Is there an age limit on this?